Our Bayliner 3058 has taken us on some great cruises. Here are some shots with blue skies and calm seas. It's always that way, isn't it? 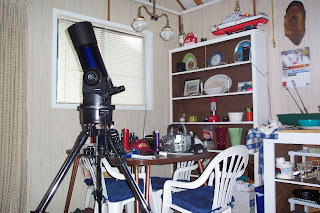 My husband Wayne is an enthusiastic amateur astronomer. He has three telescopes, a Meade ETX125 (125 millimeter) Maksutov-Cassegrain, a Meade LX90 8-inch Schmidt-Cassegrain, and a Edmond Astroscan (for fun). The LX90 has been a fixture in our cabin's kitchen for several years. On clear nights, Wayne takes it out to the corner of the deck for dark night observations. We have a small slice of the sky to view from Hole in the Wall, but the seeing conditions are excellent. 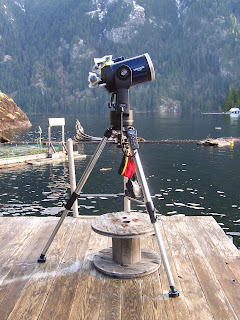 Both telescopes have the Autostar computer-driven goto feature. That's really handy for finding some of the more distant objects. The ETX125 has recently moved from our condo to the cabin small storage room. There was so much light pollution in town, we decided it was better to have both models handy up the lake. I used Wayne's telescope to take some Moon and Jupiter shots through the lens. 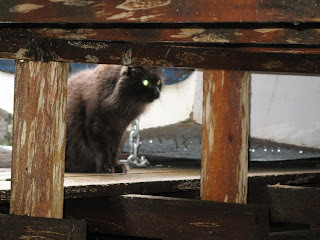 In the future, I hope to take some more, but I need really bright objects for my little Canon digital camera to work. One of my most memorable telescope experiences was with the Pomona Valley Amateur Astronomers. They booked an observing session at the Mt. Wilson Observatory's on the 60-inch telescope for the night. Not only is the scope massive, but it is a part of history. 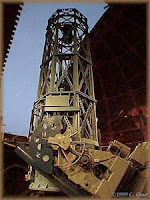 The observatory was founded in 1904 and in 1908 the 60-inch scope was installed. When it was built by George Ellery Hale in 1908, it was the largest telescope in the world. That night we saw Jupiter, Saturn and its moon Titan, a globular cluster, several planetary nebula and distant galaxies. It was quite a night! In October, I put the contents of my compost barrel and final garden clippings in a hole I dug in my hillside potato patch. I'm using a compost accelerator called Rot-It to help tougher stems to decompose by spring. After the first layer of trimmings, I sprinkled on some Rot-It and then gave it all a good watering. Then came another layer with the same treatment, and then a third layer with more Rot-It and water. The moisture helps accelerate the composting process. I covered the mound with dirt from the hole and gave it all a final watering. Then came an unexpected break in the process. We had to rush from Powell River back to Bellingham, and I didn't get back up to the cabin as planned. But while I was away, the rains continued to moisten the soil covering compost pit. When I got back in December, I continued preparing the clippings to decompose over winter. I covered the mound with two large plastic trash bags opened flat to help hold the moisture in, and generate some heat to break things down. To keep the bags in place, I put boards on top. We can get quite a bit of wind during the winter, especially over the cliff where the potato patch is located. I'll leave everything in place until spring when I work up the soil for planting. And the compost is exactly where I want it to be come spring. I have to climb four flights of stairs to get to my upper potato garden. Making my own soil up here is a whole lot easier than carrying bags up from lake level. Well, a whole lot easier on Wayne that is. What I found under the plastic garbage bags was lots of sprouts. They went into my compost barrel. On the surface, the soil looked ready for planting. The test was to dig up the plot and see for sure. I was amazed. There were only a few roots that hadn't decomposed. I added those to the compost barrel too. After digging in a bag of steer manure, my potato patch is ready for planting in about three weeks. 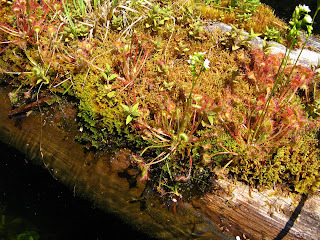 There's a small plant that grows on my floating logs just above the water line. 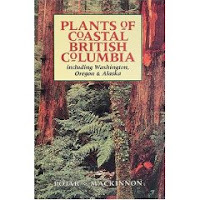 It's quite prolific during the warm summer months, growing in tightly packed groups clinging to the wood surface and wedged in cracks and crevices where moisture is plentiful. Sundews are unique both in appearance and function. They are a perennial insect eating plant (visions of Audrey II in Little Shop of Horrors!). 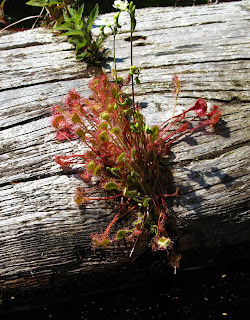 Sundews grow in moist bogs and wet meadows, but they obviously like floating logs too. As you can see, there's one leaf per stem and the stems are arranged in a radiating pattern close to the log's surface. The round fleshy leaves are surrounded by reddish "hairs" that exude a sticky fluid that is used to catch their insect prey. Out of the center of the plant a tall thin stalk rises and is topped with small white flowers. 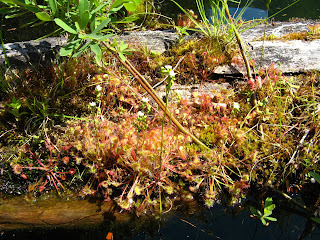 Sundews are photosynthetic, but augment their "diet" by catching and digesting insects. This allows them to thrive in nutrient poor environments, especially those low in nitrogen. Insects like mosquitoes, midges and gnats better look out. Mine were even munching on several large (by Sundew standards) blue damsel flies. The dew may look tasty, but it's the last supper for the unwary. 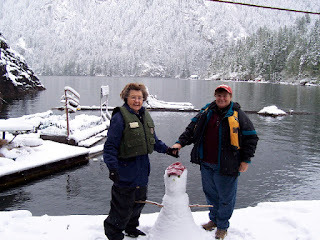 Wayne and I are always thinking of ways to improve the comfort and safety of our float cabin home. 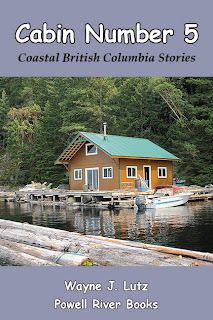 One problem of living on the water is wind waves and boat wakes. They can rock our home, but the real problem is disturbing smaller floating items such as our bridge to shore, boats, and putting stress on anchor cables. Our front boom is one large log with decorative stumps. While we were sitting on our deck having coffee, we noticed how the stumps were arranged in a more protective row. Wayne decided to take the tin boat out and tie them in that position with an extra anchor point rather than letting them swing free. Plus, it'll make it harder for them to escape during storms. In addition to breaking up surface waves, the deep roots on the stumps give even us more protection from churning water. Stick Tail settled right into cabin life. Wayne and I were amazed how relaxed he was, and how he remembered things from his visits over two and a half years ago. The couch with his afghan from home and our bed upstairs are his favourite hangouts. The first night he slept with us, but later jumped down to sleep on the hard floor next to the foot of the bed. I remembered this habit from his last visit. I decided I would make a softer cat bed for him to make it a little more comfortable for his old bones. I got an old bolster I never used and cut the flannel covering to match the size of a larger afghan Mom had made for him. I stitched it into a large rectangle and stuffed it with fiberfill, also from the old bolster. I put it on the floor where he likes to sleep and covered it with the afghan. I saw this older SUV parked at the Skagit Regional Airport after a ground soaking spring rainstorm. What an exhausting trip. Early in the morning, we left the Bellingham condo where I've lived for six and a half years with my dear lady friend Louise. Wayne and Margy explained I'm going to live with them from now on, mostly at their float cabin up Powell Lake. 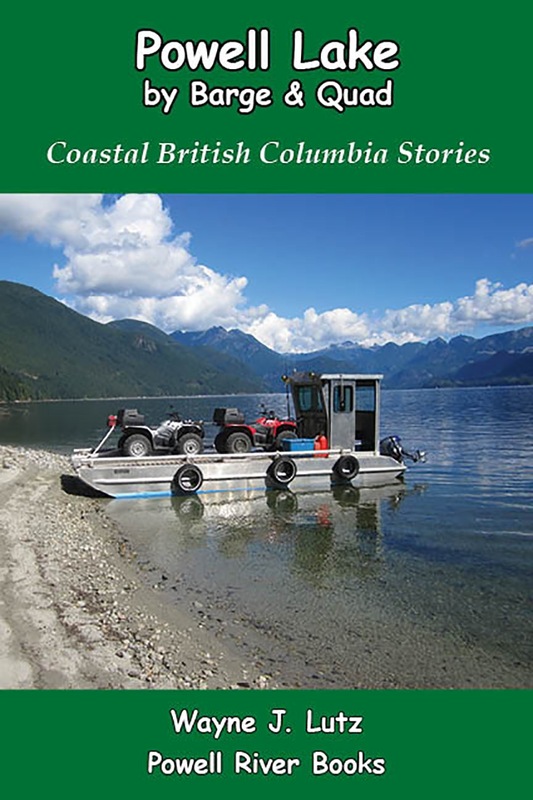 Louise and I've made the trip by car and BC Ferries many times for vacation visits. This trip it's just the three of us. 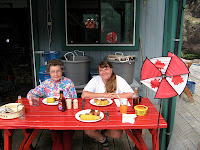 When we arrived in Powell River, it was raining and windy, so Wayne and Margy decided to stop at the condo in town. A nice overnight rest stop for all of us. The next leg of the trip came the following morning. 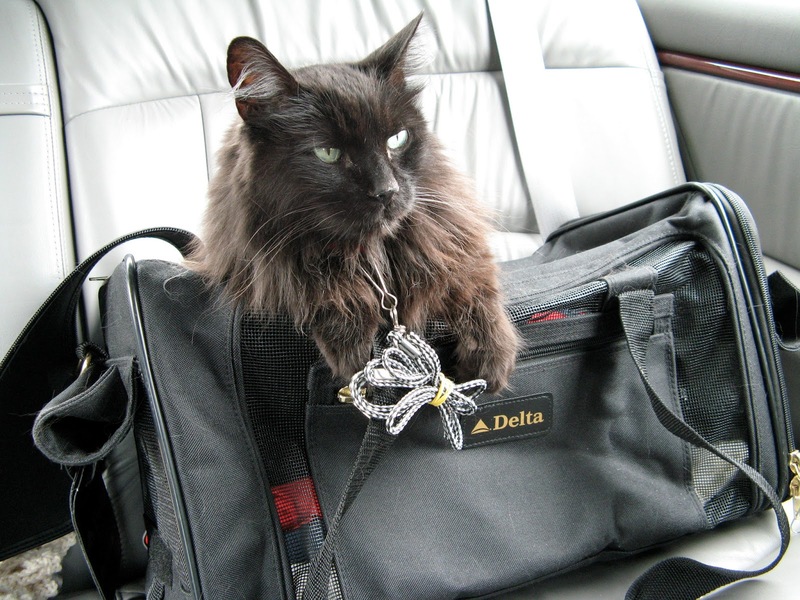 I had to ride in my carrier. Margy explained dogs frequent the boat docks. 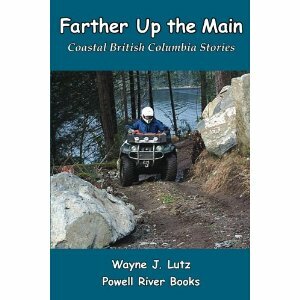 It was all a bit fuzzy in my memory, but once Wayne cranked the boat engine it came back in a rush. Margy held my carrier in her lap and opened the corner so I could look out. She was right, it was less scary down in the bottom. Wayne carried me into the cabin. Once Margy had my food bar and litter box set up, I got out. It was just as I had remembered from the last time Louise and I came for visit two and a half years ago. I'm always thirsty after a long ride, so I went right to the food bar. Margy was amazed I remembered so well. What did she expect? The litter box is in the new bathroom right next to their compost toilet. I've heard some humans say they're almost the same. At least you don't have to crank mine when your done with your business. I impressed Wayne and Margy so much they let me outside on the first day. I always check out the flowers first. For as long as I can remember, I've loved rocks. They don't have to be fancy or exotic rocks, just rocks that are pleasing to my eye. When I travel, I like to collect rocks that remind me of where I've been and what's I've seen. 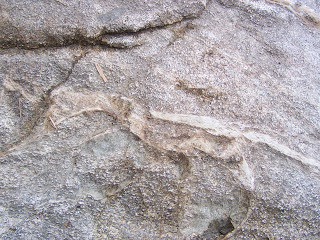 Dike (black) running through granite. The rocks then become decorative items for my home. But of course, some rocks are too big to collect. 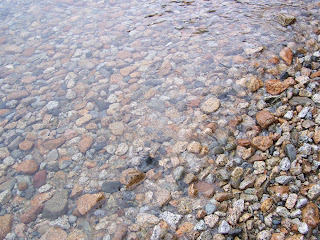 In addition to collecting rocks, I like to take picture of rocks, especially those in streams, at the beach or along the shores of a lake. Powell Lake and the other deep fjords in British Columbia were carved by ice age glaciers moving over the land's surface. Rocky surfaces still record their passing. Glacial striations on Powell Lake's shoreline. You might also be interested in an event that occurs on the second Sunday in September. 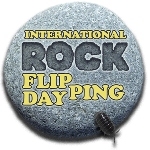 It's International Rock Flipping Day. Here's a link with photos from last year on Flickr. Also, here's a link at Susannah's Wanderin' Weeta (With Waterfowl and Weeds) blog with more information. Check back in late August to get an update. Wayne, Stick Tail, and I are heading home to the float cabin this week. This will be Stick's first trip since Summer 2010. After that, he's stayed with Mom at the condo in town. As an indoor only condo cat, he should enjoy the outdoor freedom. 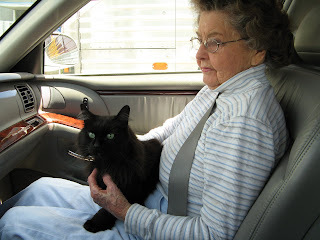 This will be a poignant trip, the first in Mom's Buick we lovingly call Big Bertha, but without Mom. However, she'll be going with us in spirit. Mom will always be an important part of our lives. 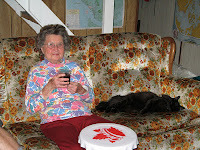 As I looked through some old photos, there are some great ones of Mom and Stick at the cabin. I'm so glad I was able to share float cabin living with Mom in all seasons. Winter was the hardest. We had to keep the fire going day and night to keep the interior warm enough. But as I've said before, Mom was a trooper. Plus, she was a long-time camper with Daddy and me. Mom always loved her glass of red wine at happy hour. Chin-chin! Saturday was Opening Day for boating. The Bellingham Yacht Club (BYC) hosted a boat parade that left Squalicum Harbor and headed to Historic Fairhaven. We didn't make it in time to see the parade, but did notice some of the aftermath. Lots of sailboats were sporting flags, fluttering colorfully in the breeze. Wayne and I headed to a small cove on Lummi Island called Inati Bay. 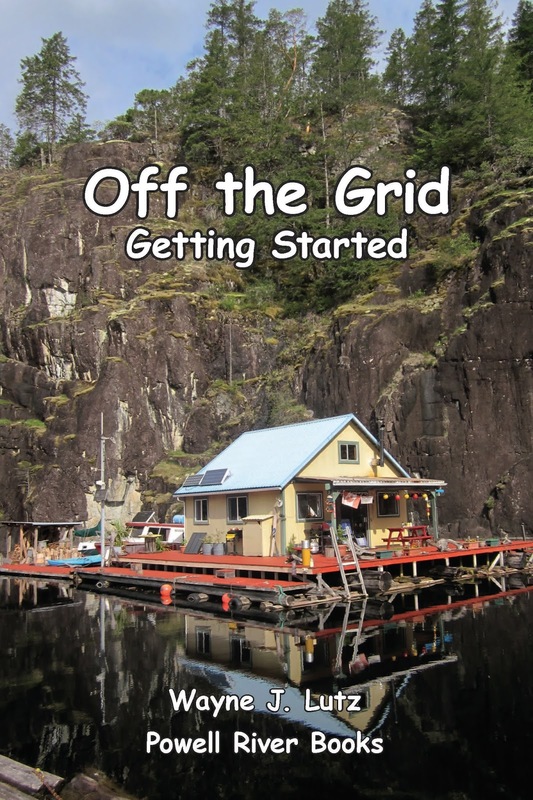 This is a private outstation of the BYC and only members can go ashore. But we only wanted to drop a day hook and enjoy the warm sunshine onboard. Boats are decorated for the parade. This year's theme was Derby Days. Opening Day was the same day as the running of the Kentucky Derby. But we didn't learn this until after we got home. Sitting at anchor in Inati Bay, we saw a boat heading our way. It was hard to make out what it was. At first I thought it was a fishing boat with little cubicles for fishermen to stand in while trolling. As it got closer we saw a starting gate, complete with horses and jockeys. On top a jockey rode a long-neck Geoduck clam. Longnecker is also a family name, so I'm left wondering if it was named after the clam, the family, or both. The decorations were amazing. When the boat turned around, you could see the horses' rumps and tails hanging out. Click on the large picture and you can read the horses' names. There were bails of hay and a full-size horse riding on the bow. If this boat, didn't win first prize, I can't imagine what did. Good-bye Mom, I Love You!